The midi you are listening to is a traditional tune called, 'Rest Thee Babe. You're looking across the River Thames at the famous London Bridge in London, England. London Bridge, is built on the site of a wooden bridge built by the Romans in 75 AD. 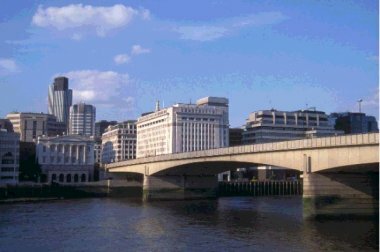 It is to this bridge at the lowest bridging point of the River Thames that the city of London owes it's origin. The early wooden bridges were frequently washed away by floods and the last, (963-75) was replaced (1176-1209) by a stone bridge with houses and a chapel. The buildings were removed from 1756 to 1762. London Bridge remained the only bridge over the Thames at London until the construction of Westminster Bridge between 1739 and 1750. The bridge was many times damaged by fire and was finally removed in 1832 after the opening of a new bridge in 1831. This next, granite bridge, five-arched bridge spanned the Thames until 1968 and was 928 ft (283 m) long. It was designed by John Rennie and built between 1824 and 1831. In 1968, London Bridge was dismantled and purchased by Lake Havasu City, Ariz. (Rumour has it the purchaser thought he was purchasing Tower Bridge). In 1973 the present London Bridge now made of concrete was opened.